There are so many versions of dandan mian as there are eaters of dandan mian that I'm not even claiming this to be a definitive version, even within the limited confines of our household. First of all, there's eggplant in this dandan mian! How did that happen? Well, I happen to have some eggplants around and I thought it would be a good way to use eggplants. 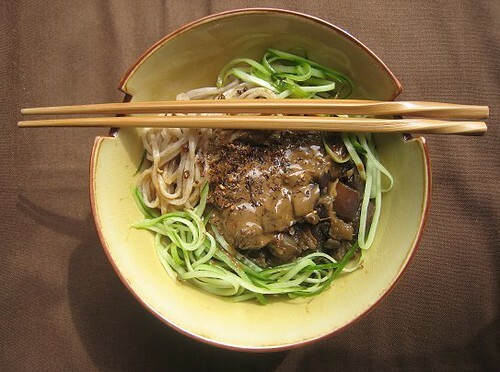 The creaminess of mushed eggplants seem to be a natural fit in dandan mian. This is a more a dry, sesame-y version of dandan mian, rather than a broth-y, more vinegar-y version. 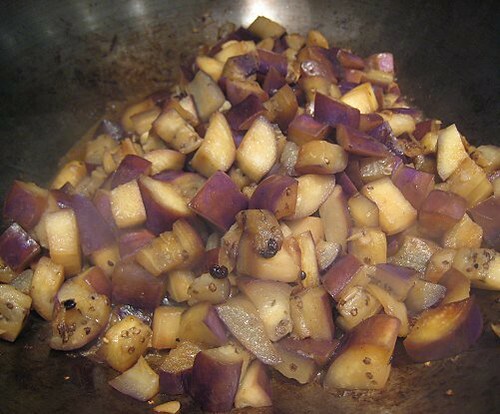 Given that during this time we were trying -- in our delusion, still trying -- to eat within "healthy" guidelines, I thought that I could cut down on the amount of oils and sesame paste by using the creaminess of eggplants in its stead. I even bought whole wheat noodles to use in this dandan mian to push up its health-quotient. Please note that I don't think our diet is particularly unhealthy. Our problem is we like to eat, and when we eat, we tend to have no self-control and eat to our hearts' desire. We like to eat different cuisines -- and some of these cuisines have not gone over to the "light" side of whole grains and lean meats. I tried, oh yes, I tried, but gosh darn it, lean meats are just not as flavourful as those intermarbled with fat! It's pork belly or bust in this household. Whole grains? Well, as I have lamented before, sometimes whole grains just cannot be substituted for their white counterparts. I mean, there's got to be a reason why we've milled and sifted flour to be white. Doesn't it taste so much better as a pizza crust? 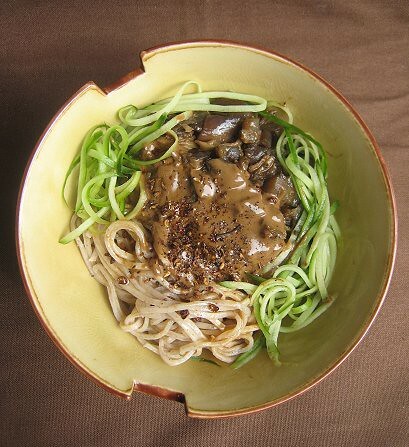 Forgive the circuitous route to the procedural portion of this eggplant dandan mian. 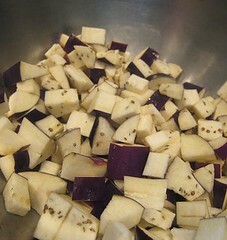 I started by adding garlic to a scant 2 tablespoons of chili oil and stir-frying the eggplant. Following Fuschia's recipe for a version of dandan mian, I thought I'd add some Tianjin preserved vegetables as well so I stir-fried that with the eggplant as well. I added some Shaoxing wine, soy sauce, Chinkiang vinegar, and water to the pan. I covered the pan and let the eggplants steam until they were soft and creamy. 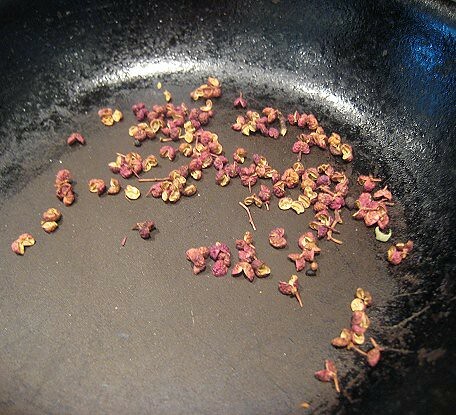 Meanwhile, I roasted some Sichuan peppercorns in a separate pan to be ground in a mortar and pestle. I like my dandan mian with a more than generous sprinkle of ground Sichuan peppercorns. 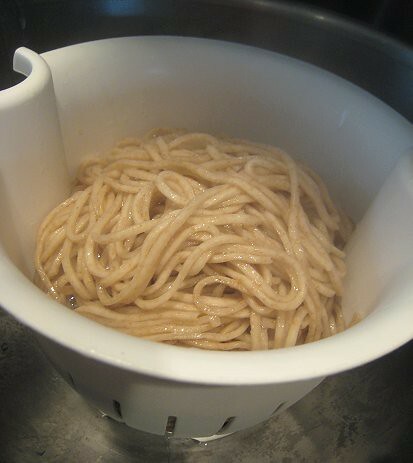 That above are the whole wheat noodles. We simply boiled them until done. 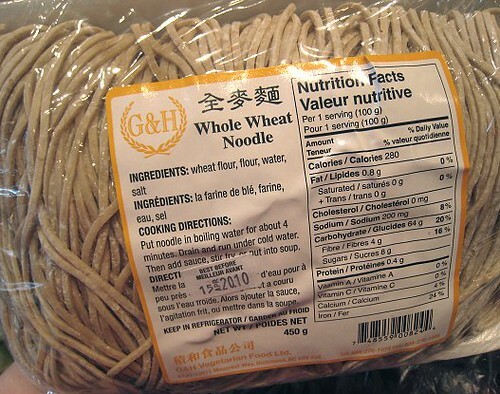 Actually, I don't mind whole wheat noodles. I actually quite like them! But I guess, as mentioned before in our Brown Rice Bibimbap post, it depends on the application. To make the second part of the sauce, simply mix soy sauce, chili oil, and sesame paste. As we were trying to cut down on the fat, we were a tad skimpy with the oil and the sesame paste. Rest assured that the recipe below reflects corrected amounts for maximum deliciousness. I don't know what we were being so skimpy about, as it would have only an extra 120 calories per serving, according to TS' calculations. 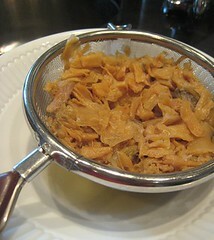 After cooking the eggplants and boiling the noodles, the dandan mian is simply a matter of assembly. 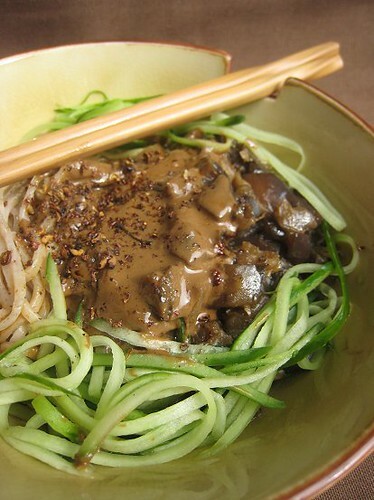 Our whole wheat noodles went in first, followed by cucumber shreds, the eggplant, then the sesame sauce. Each bowl was finished with chili oil and ground Sichuan peppercorns. Of course, it's up to you, but the more chili oil, the better. For the chili oil, use Sichuan Peppercorn Chili Oil, or Red Chile Oil (紅油), or a combination of both! For chili oil, make either Red Chile Oil (紅油) or Sichuan Peppercorn Chili Oil. Heat chili oil in a wok. Add garlic. When garlic has released its fragrance, add eggplants. Add Tianjin preserved vegetables. Add Shaoxing wine, vinegar, soy sauce. Add water and cover. Cook until eggplants are soft. While noodles are cooking, make the sauce. 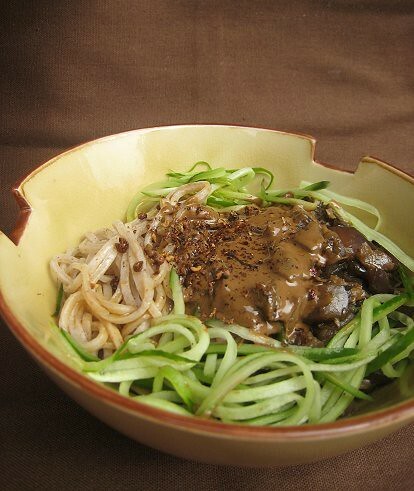 Mix soy sauce, chili oil, and sesame paste in a separate bowl and stir until the ingredients have blended together. 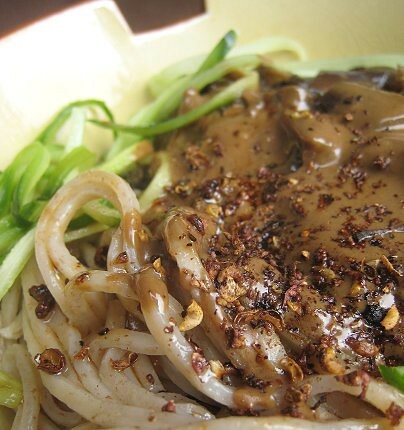 To serve, coat noodles with sauce, add eggplant mixture, add bean sprouts and/or shredded cucumbers, and top with more chili oil and ground Sichuan peppercorns as desired. I bet this is a way I could get Matt to eat eggplant! I've been meaning to make dandan mian for a while now...and I think I'd actually enjoy it MORE with eggplant! This sounds and looks amazing! I never would have thought of using eggplants in dan dan mian but I could definitely see how the creamy texture would be perfect with the sauce! I love the texture of Dan Dan noodles. This dish, by the way, looks absolutely awesome! I'm enamored with that silky looking eggplant sauce. Never heard of dandan mian, so not fussed about authenticity of this. What I do know is that this looks superYUM! 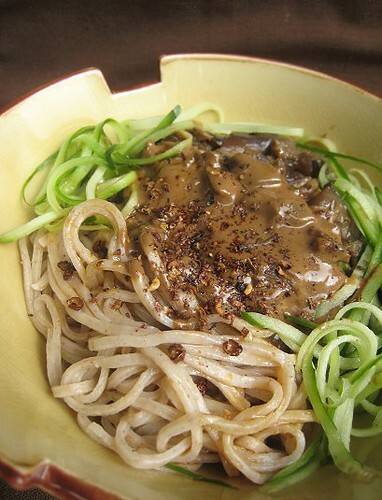 I really like the sound of an eggplant dandan mian! I used to dislike eggplants except in one certain dish, but they're growing more and more on me.